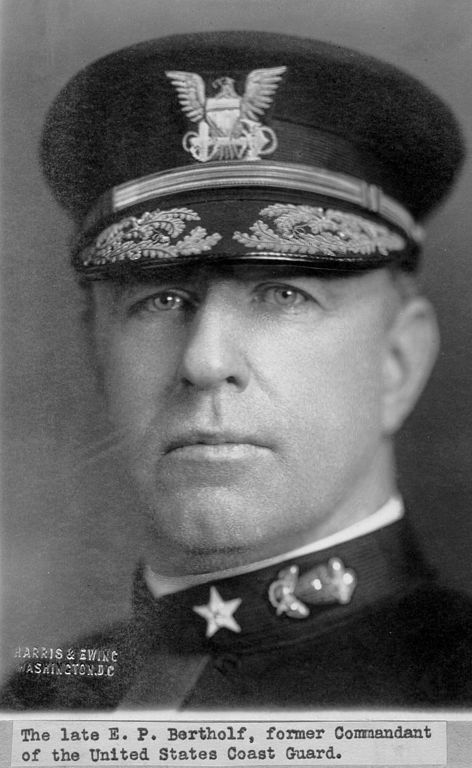 Photograph of Ellsworth P. Bertholf, Commandant of the U.S. Revenue Cutter Service from 1911 to 1915 and Commandant of the U.S. Coast Guard from 1915 to 1919. Coast Guard photo. We all know August 4th as Coast Guard Day, but it was actually January 28, 1915 that the Coast Guard was formed by the joining of the Lifesaving Service with the Revenue Cutter Service by Act of Congress. Take a look at the law in the link above. Its is pretty detailed and shows how different things were then. Of course it has been 104 years. There was no joining or merger of the two agencies. Most people do not read beyond the descriptor line. However, the text of the law’s first paragraph shows the full intent of Sumner I. Kmball to keep the USLSS a separate group.